This handcrafted valet jewelry box has a special artistry all its own. Contemporary and beautiful accents appeal to men and women alike and makes a wonderful special occasion gift for anniversaries, graduations or milestone birthdays. 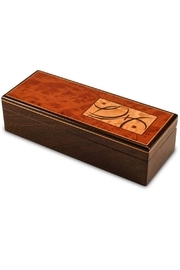 Features a scrolling marquetry design fitted precisely in the Madrone burl wood top and deep brown wenge hardwood is the main portion of the box. This distinctive box features an inside sliding tray for organization and accessibility, felt feet for protection, and a soft pearl lining to protect jewelry. Designer Mike Fisher's signature is engraved into the bottom of the box for a last touch of artistry. Made in USA. Measures 12 1/2" x 4 3/4" x 3 1/2"